Lighting is a wondrous decorating tool. A good lighting plan can help any home be more inviting and safe by combining the basic types of lighting for style and function and get the feeling and ambience you want to convey in your home and still be economical. Ambient lighting-provides overall illumination and comfortable level of brightness, allowing you to move around and see safely. Overhead lighting is most common. Use warm and natural light bulbs. Task lighting-helps you perform a specific activity such as reading or cooking, by concentrating light in a particular place. Use fluorescent lighting to light up work area. Accent lighting-creates a mood and adds interest to a room by spot lighting certain area or objects such as paintings, collectables, or walls. It is most effective when it is used sparingly and creatively. Use long lasting halogen floodlights in your track and recessed fixtures to provide wide beams of clean lights. Decorative lighting-becomes part of a room decoration such as chandeliers, candles, torch ere lamps, and wall scones. Use incandescent light bulbs to bring out the tones of the room. The bulbs can be used with dimmer switches. 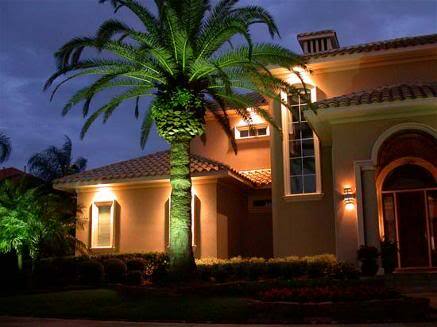 Outdoor lighting: Outdoor lighting is a good way to add drama and curb appeal to your home. For a full balanced effect, use a variety of subtle lighting techniques with multiple levels of brightness. –Use motion sensing fixtures and get light only when you need it. –Install lights on either side of all doorways and above so the steps, doors, house number and locks can be seen easily. –Light path evenly by overlapping the patterns of light. Sharp contrast of light and dark can confuse or disorient your guests. –Up lighting is the perfect way to add drama to trees, landscape features such as water fountain, and architectural elements of your home. Place light at an angle and light the object from below. Use heavy duty all weather bulbs designed to withstand harsh weather conditions. –Back lighting creates beautiful silhouettes by placing objects you want to highlight in front of a lit surface. For an eye catching effect, angle the light against the wall or fence behind the object. Foyers and Hallway Lighting: This area of the home give the first impression of your home’s interior. It should provide basic illumination for safety and a welcome atmosphere. –Sizing fixture to the space. Place lighting fixtures every 8-10 feet in hallways. –Placing some fixtures high on the walls in an entry to provide flexible lighting. Directing lights downward will add drama and feeling of spaciousness. Adjust the beam exactly where you need it. –Dimmer switches are helpful in the entry way. There create a lower level of light to help visitors adapt to the sudden change in light levels when coming in from the outside. –For safety on stairs, place a down light at the top and a wall scone at the bottom of the stairs. This defines the edge and depth of each step, including the bottom step where most accident occurs. –In area with higher, vaulted ceiling (above 8 feet) consider using halogen track lights to highlight artwork in hallways and entry area. Use torch ere lamp to soften the appearance of walls and ceiling. Living Room Lighting: Living room functions as both for family relaxation and a place to entertain your guests. Create maximum flexibility and impact by carefully planning the lighting sources in the room with multiple layers of lights. Use wall washers, down lights, and accent lightings on separate dimmer switches to create a variety of possible effects from spacious to intimate. Place light source at various heights within a room (ceiling, table, floor) to add visual interest and scale. –Recessed lighting is preferred to light a general area because the light source is also concealed. –Stone, brick and other textured walls can be emphasized by a wall washing technique called “grazing” (by position the light source to a wall or tree to bring out its texture). Place recessed directional fixtures 6-8 inches away from the wall and 12-30 inches apart and aim the beam down ward for a dramatic visual effect. –To highlight your art, collectibles, and other points of interest consider pools of accent lighting. –Use translucent shades on table lamps to contribute to the ambient light level. Kitchen and Dining Room Lighting: Layering with light from a variety of sources to get the most flexibility for creating different moods in the same room and help with tasks at hand. –Kitchen that is less than 100 square feet requires two-lamp fluorescent. Down lights placed 18 inches from the edge of the cabinets and spaced them 3 feet – 4 feet on centers is ideal to generate additional lighting. Use recessed halogen or fluorescent valance lighting or recessed down lights mounted directly over the sink. –Cool white fluorescent bulbs will enhance cool color like gray or blue; warm white bulbs enhance warm color in your kitchen or dining room like yellow, red, and beige or to compliment wood cabinets. –Use switches for general and task lights separately and use a dimmer for all halogen lights to create different moods for cooking and entertaining. –Under the cabinet fixtures should be mounted as close as possible to the front edge of the cabinet to avoid glare on the work surface. Use 2 watts of electricity for every linear foot of counter space. –For accent lighting, use halogen track lighting fixtures to give your kitchen extra dimension and illuminate special objects or food presentation areas. 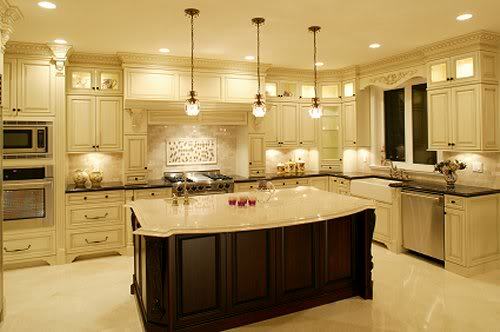 –A light fixture hung over an eating area will separate it from the working area of the kitchen. Hang the fixture with distance of the bottom of the fixture to the top of the table no less than 30-36 inches. Select a fixture 12 inches narrower than the top of your table. –Keep your chandelier dimmed to avoid glare and shadows on your table mates. Install small recessed down lights with dimmer switches on either side of the chandelier to supplement the ambient lights. Use these and combine with your own and other ideas to help you decorate your home using lights.